Waiting For The Sun Deux - Cognac Need Help? Waiting For The Sun's hand-carved all wooden sunglasses offer a unique look and feel like no other. 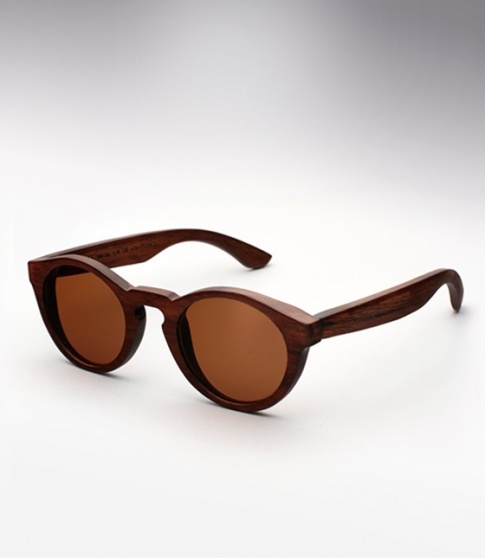 Handmade in Paris France, Waiting for the Sun sunglasses are meticulously constructed using super lightweight natural materials such as Australian tea wood, rose wood, or bamboo. All models are hand-carved one at a time, preserving the natural features of each piece of timber. So like each piece of wood which has different natural veins, each sunglass is unique. The Waiting For The Sun Deux is a classic P3 shape that takes its queues from the 1920's. Smaller fitting and thick, the Deux is perfect for those with a small to medium face or those who just want to go for a nostalgic look. Constructed entirely out of rose wood, they feature Carl Zeiss lenses for superb optics and optical spring hinges for added comfort; offered here in a "cognac" with dark brown lenses.